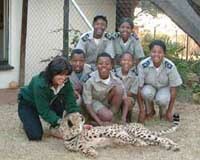 The De Wildt Cheetah Centre was established in 1971 with the aim of breeding endangered species. Since that time the Centre’s efforts have resulted in the major achievement of breeding what was once a threatened species, the cheetah (Acinonyx jubatus). Over the years over 750 cheetah cubs have been born at De Wildt – a dramatic contrast to the days when the cheetah population of South Africa was estimated at a mere 700. While the cheetah project was the base from which the Centre launched its conservation ethic, it soon widened to include other rare and endangered animals such as the wild dog, brown hyaena, serval, suni antelope, blue and red duiker, bontebok, riverine rabbit and vultures - including the very rare Egyptian vulture. Many of these have been successfully bred for later reintroduction into the wild, thus helping to repopulate areas where such species have disappeared or are no longer abundant. In January 1997, De Wildt teamed up with the Vulture Study Group of the Endangered Wildlife Trust, whereby injured or poisoned vultures are brought to the Centre to be incorporated into captive breeding populations. Vultures at the Centre include Cape griffon, Lappet-faced, White-backed and the very rare to South Africa Egyptian vulture. Tshwane District South Partnership beneficial for conservation education The Outreach Education Programme recently met with representatives of the Gauteng Department of Education (GDE) Tshwane District South, one of whom is Georg Jaquelin, School Enrichment Coordinator. During this meeting District South representatives were introduced to the Ambassador Cheetahs and were furthermore provided with the opportunity to see first hand what the OEP presentations entail. As a result of this meeting, the De Wildt OEP has been accorded partnership with GDE Tshwane District South, which should prove extremely beneficial in furthering the reach of conservation education. Intentions are to do an OEP presentation at the next Provincial Education Department meeting, which is scheduled to be held during April. Keep an eye out for highlights of this presentation in our next edition. * Take R511 from Johannesburg to Sandton (William Nicol highway). * Pass the Indaba Hotel. * Road is signposted R511 Brits. * Past Fortlike garage on you right hand side. * Turn left at signpost R511 Brits. * Follow winding road for approx. 15km, over Hennops River to four-way stop. * Go over four-way stop, past aquarium on the right to Total garage. Turn right - signposted R511 Brits tunnel bypass. * Approx. 4km to T-junction, take left fork. * Road climbs over Silkaatsnek pass. * Pass first right turn. * Second right turn signposted R513 Pretoria North - turn right. * From here it is approx. 4-5km on right hand side. * Travelling time from the Indaba Hotel is approx. 1 hour. Enjoy your trip and drive safely!